Transform your property management business by connecting with residents like never before through Social Media, e-Commerce, On-line Communication & e-Payments. Join the conversation, get connected, increase NOI & extend your success for free. Stay ahead and create value. MyHomePayge allows you to harness the power of the Internet and the Social Web while also providing you with a suite of services that will keep you connected to your residents wherever they are. Best of all its free and easy to use! Keep up to date and communicate. Your customized Property Portal enables you to communicate property events on the Calendar and Bulletin Board, receive and track Work Order Requests and send important notifications and alerts in real time. on their desktop or smartphone. Amenities your residents will love. Our virtual concierge helps your residents manage their daily chores so that they can enjoy the better things in life. mySavings and myDeals help your residents save money with powerful comparison shopping tools and deals, tailored specifically for them, from local merchants and on the web. We always provide high quality and reasonably priced products and services that meet their everyday household needs. myConcierge will become THE one stop resource for your Residents and their families. With our fully integrated Payment feature, you'll have the option to enable your residents to pay their rent or dues electronically. If you choose to activate this feature, your residents will be able to pay their rent or dues through ACH, major credit and debit cards, even their PayPal account! Your leasing and sales staff along with outside brokers will appreciate our On-line Application feature. With its fully integrated background and credit check, they'll be able to immediately qualify prospects with the push of a button. We'll even customize it to meet your requirements and prominently display your brand! With Myhomepayge, your information is always secure. Myhomepayge uses the same 128-bit encryption that banks use. Our Payment Portal uses an even higher 256-bit encryption standard and is PCI compliant. Our PCI practices are monitored and verified by McAfee Secure. You don't need any special software or training to use Myhomepayge. You'll be up and running in minutes. Signing-up is easy and it's commitment free. Your residents are talking. Your prospects are listening. Your goal of increasing NOI hasn’t changed, but with the paradigm shift caused by social media, the means to achieve that goal has changed. With Myhomepayge you’ll be able to listen, analyze and engage across the Social Web. Create property Facebook and Twitter pages; Curate those pages with engaging content; Manage each social media site in real time; and Report mentions, ratings and reviews. The social web is a goldmine of untapped opportunities. Give your brokers and leasing staff the social tools they need to attract and convert prospects into residents on customized and branded Facebook and Twitter pages. By listening to your residents over the Social Web, you can deliver amazing service, build relationships within your communities and increase retention. Shape your brand and manage your reputation. Know how your brand is perceived by the people that matter, and build a community of advocates that can influence sentiment about your properties and you. Harness the power of social media and rise above the competition. Attract, convert and retain residents. Amenities that actually create value. Our amenities package enables you to provide the digital lifestyle your residents have come to expect. Attract, convert and retain more residents than ever before. Oh, and did we mention they’re free? Myhomepayge Concierge is like having an assistant in the lobby of your buildings 24/7. Impress prospective residents and delight current residents with this transcending new amenity. With our Savings and Deals programs your residents will develop binding ties to their neighborhood and your building. Powerful tools to save time and money running their household. Strong relationships with local merchants. Loyalty to your building and their community. Distinguish your properties, generate positive sentiment, create loyalty and build your brand. Attract, convert and retain. Our communication package is an efficient and cost effective way to communicate with your residents and a convenient way for residents to communicate with you. Send important messages, notifications and reminders by system message, email, text and RSS … All in real time! We create a customized landing page for each of your buildings. 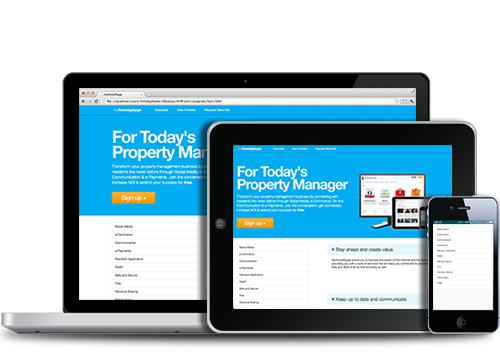 mHP’s Property Portal links seamlessly with your website or can be used on a stand-alone basis. Keep your residents up to date with events in your building and community on the Calendar and Bulletin Board. With our Property Portal your residents can send work order requests when they need something fixed. They can even provide you with permission to enter, remind you about their pets and track status. Broadcast security and safety alerts to your residents. Tie into local law enforcement to let residents know about things like Amber and Silver Alerts in their community. The mHP communications platform does it all. Easy, efficient, cost effective and convenient. The way your residents want to pay. Options that are easy and convenient. With our fully integrated Payment feature, you'll have the option to enable your residents to pay their rent or dues electronically. Your residents will be able to pay their rent or dues the same way they pay all of their other bills, through ACH, major credit and debit cards, even their PayPal account! Payments are deposited directly into your designated bank account for each individual property that you manage. All payment information uploads into your existing accounting software with the touch of a button. Open a simple business account in a matter of minutes and we'll process payments for you or you can act as your own Merchant and do it for yourself. We'll customize myPayments to prominently display your brand and offer features such as electronic invoicing, payment tracking and collection of application fees, security deposits and late fees. With Auto-Pay your residents can set up their monthly payments in advance. Our Mobile app enables your residents to pay their rent right from their smart phone on-the-go. No more excuses. Myhomepayge uses the same 128-bit encryption that banks use. Our Payment Portal uses an even higher 256-bit encryption standard and is PCI compliant. Our PCI practices are monitored and verified by McAfee Secure. Today's way to seal the deal. With myApplication your prospects can apply to rent or buy while they're working with your leasing staff or broker. You'll be able to instantly process application fees, run background and credit checks, and if approved process their security deposit and first month's rent on the spot using their e-check, credit or debit card. You can link myApplication directly to your website and your prospective residents can access it directly on Myhomepayge. Can I customize? Yes again! We can customize myApplication to prominently display your brand and tailor it to whatever form you're presently using. You don't need to change anything. Just provide us with your Form and we'll do the rest. We'll beat your existing rates. With myApplication you only pay when you use an application…there are no upfront, monthly or hidden fees. Leasing professionals AND residents love our Online Application. It enables both to close the deal today! Glad you asked. It's our Resident Awareness and Adoption Program. It's specifically designed so there is ZERO cost to you, and we do all the work. We even lick the envelopes. We'll provide the introductory letter and brochure, stuff the envelopes, pay for postage, send the emails, display our signage (with your approval of course) and distribute a welcome gift. Whew!!! You don't have to lift a finger. Resident's always enjoy a free social get-together. We coordinate the best time and place…and then we handle all of the details….from soup to nuts. Our team is great at getting the word out and generating excitement! We're really careful about only sending your Residents things that will be interesting and relevant to them. If they ever change their mind, they can simply click on our unsubscribe link and we will discontinue sending them offers. They'll still be able to access all of our free services. So what's the catch? There is none. How can Myhomepayge be free? It's simple. The fees that merchants pay us for bringing them new customers enable us to keep our service free. Even better, we share some of that revenue with you. Myhomepayge Concierge will enhance your residents' living experience and keep you at the forefront. Our Property and Payment Portals enable you to reduce operating costs AND generate a brand new revenue stream. Hmmm…doesn't every property manager want satisfied customers, lower costs, additional revenues and a competitive edge? So how do we make money? Three ways… On advertising and sponsored links just like Google and Facebook. For bringing new customers to local merchants just like Groupon and Living Social. And when your property manager uses some of our cool features like our electronic resident application. It's as simple and straightforward as that. We're committed to staying free for everyone, whether or not your residents ever act on one of our savings recommendations. If a resident chooses not to receive our offers, they can simply unsubscribe and they'll still be able to enjoy all of our free services. Your residents get a great new amenity that saves them time and money. Our participating merchants gain new customers. You get satisfied customers while reducing costs and gaining a new revenue stream. …and we make some money along the way. Yes…we share our revenues with you. What's the deal and how does it work? Our revenue sharing program for Property Managers is simple and straightforward. We track the gross revenue we receive from the offers made to your residents, and we share 20% of those revenues with you. Stay ahead. Enjoy the benefits. myHomepayge is cost free, so every dollar of revenue from our program drops right to your bottom line. With the razor-thin margins in property management today, it's the edge that will keep you a step ahead! You have questions. We got Answers! Myhomepayge is a digital media company which provides residential property managers with the tools they need to connect with their residents like never before. mHP allows property managers to harness the power of the internet through Social Media, e-Commerce, on-line Communication and electronic Payment solutions. How much money will Myhomepayge cost me? Myhomepayge is available to our member Property Managers FREE of charge! What do you expect of my staff and me when implementing Myhomepayge? All we ask is that you designate a contact person to coordinate with us…and we do the rest. Do I need any special equipment or software? No. Because accessibility is via the web or smart-phone. Myhomepayge does not require the purchase of additional hardware beyond your existing telephones and web enabled devices such as PCs and smart-phones. How long of a commitment do I need to make if I sign up? No commitment whatsoever. If you are not completely satisfied, you can close your account at any time. Glad you asked. You can sign up right on this microsite. How do you make my residents aware that I have signed up for Myhomepayge? Our Resident Awareness and Adoption Program or “RAAP” is specifically designed to make it known to your Residents that you have signed up with Myhomepayge. We educate them on all of the wonderful benefits they will receive as a result of YOUR action. If I sign up for Myhomepayge can I add the Payment option at a later date? Yes…You can add (or drop) our payment functionality at any time. Yes…your residents can access most of our services on their smart phone…including paying their rent. If my resident has a question about Myhomepayge who do they call? They call our Customer Service Department… 855-703-3500. Why have other Property Managers signed up for Myhomepayge? Our member Property Managers first and foremost recognize that in order to continue their success in today’s world they need to have the right tools. That an amenity like Myhomepayge will enhance their residents living experience at their property, which gives their Property a competitive edge and which will result in enhanced NOI. In addition, with mHP they only have upside… if we are right they reap tremendous benefits…if they are not satisfied for any reason, they simply stop working with us. Do you plan on adding more services in the future? Yes. The Myhomepayge platform is capable of supporting a wide range of applications in addition to these initial offerings. We’re always working on new, cutting edge, cool services and products that your residents will enjoy. We will keep you informed as new products and services are developed and available. Three ways…On advertising and sponsored links just like Google and Facebook…For bringing new customers to local merchants just like Groupon and Living Social…And when you use some of our features like our electronic resident application. What Social Media services do you provide? For each of your properties we will create, curate and manage your Facebook and Twitter pages… and each month send you a social media report . What if I already have Facebook and Twitter pages? Then we will curate and manage your existing site(s) for you. What do you mean by "curate" my site? Curating means we research, produce, organize and edit all of the interesting content that appears on your property’s Facebook and Twitter pages . Effective curation is the best way to build a property's following and create a “brand” out of your property. We eliminate the "noise" by finding and creating interesting topics and storylines for your residents and prospective residents to enjoy and participate in. Ideally you will provide us with as much property news as you have and then we will curate it and load it onto the appropriate site(s). If you find providing information challenging for any reason, no worries, we will guide you through it. What’s in the reports we’ll receive? Visibility Monitoring, Ratings and Reviews and "Mentions". What does that mean? It means you will receive a monthly report which will include everything, good or bad, that was said about you or your property. We discuss with you the genesis of the comments and then we prepare a response which includes the action you will take to improve your services. How do you maximize likes? With your permission we create incentives for your residents to rate their experience living in one of your communities. Since the overwhelming amount of people respond positively when providing a rating, that's the result we will expect for your building. What type of goods and services will you offer my residents? We seek to provide discounted deals on “necessities” that will help your residents run their households. While occasionally a luxury item may be offered, we look primarily to offer great deals on stuff people really need. Which merchants do you seek discounted deals from? We look primarily to local merchants because they are eager to earn your residents trust so that they become steady customers. How do we know that the merchants are reputable? Because we guarantee it! That’s right…mhp guarantees every item purchased from merchants on our site. What if one of my residents doesn’t want to receive discounted deals whatever reason? They press the "Unsubscribe" button which is at the bottom of every email and that’s that. If one of my residents “Unsubscribes” will they still have access to Social Media, Communication and Payments? What communication services do you provide for existing residents? We provide online Bulletin Board, Calendars and Maintenance request forms. Can residents add content to the Bulletin Board or Calendar for other residents to read? No. Only you, the property manager, can add content to the Calendar and Bulletin Board. Will there be a log of Maintenance requests made and responses to those requests? Yes. Both you and the resident will have access to the log of requests made and answered. What communication devices do you offer me for prospective residents? We offer Online Application as well as electronic Background and Credit Check. Is your Online Application standard or can it be customized? If I charge an application fee for Online Application, can the applicant electronically? If you activated our payment feature, absolutely. They may pay their application fee by ACH, credit or debit card or their PayPal account…right there in your office…or if they are applying remotely…right from their computer. If I accept a tenant can they pay their first month’s rent and security deposit electronically? Yes again...same answer as above…in a competitive market, the ability to right on the spot accept an applicant is a major factor in our PM’s electing to use our Online Application feature. How about background and credit checks? Our Online Application allows you to run background and credit checks…again, right there on the spot. What fees are there for online application? Fees vary depending upon which package you choose. Once I sign on for Online Application am I bound to use it every time I receive an application? You use Online Application whenever you want…sometimes, all the time, once in a while…it’s always available to you. An ACH is simply an electronic transmission of a check from a Residents checking account. Sending an eCheck is identical to making a payment from a checking account. ACHs, because they are transmitted electronically, are processed much faster than conventional checks. What information must I provide to receive electronic payments? You need to provide us with your banking information… routing and checking account number(s). How do you protect my banking information? How much are your convenience fees and who sets these fees? We have set ACH and PayPal convenience fee at $1.95 regardless of the amount being paid. The credit card companies and the banks set credit card fees… They are typically 2.49% of the amount of rent or dues charged and we merely pass them through. Do I receive RevenueShare from myPayments? No…We strive to have the lowest fees in the market and our fees are calculated so we can generate just enough money to cover our costs of providing you with this service. Therefore, there is no Rev Share from myPayments. Do you have an “Auto-Pay” feature? Do I have to open a merchant account? Yes. It only takes a few minutes and we’ll walk you through that process. What if a Resident walks into my property office and wants to pay by credit card, can I accept it? Yes. You would simply process the payment through the portal. You can accept credit cards at ALL property locations without purchasing expensive credit card machines. How are Returned Items handled and how long does that process take? We handle all Returned Items. They are typically identified within 1-2 business days – much faster than traditional checks. The resident will be responsible for a Returned Item fee. Are there any other fees for processing payments electronically? We have ZERO other fees. © 2019 Myhomepayge, Inc. All rights reserved.